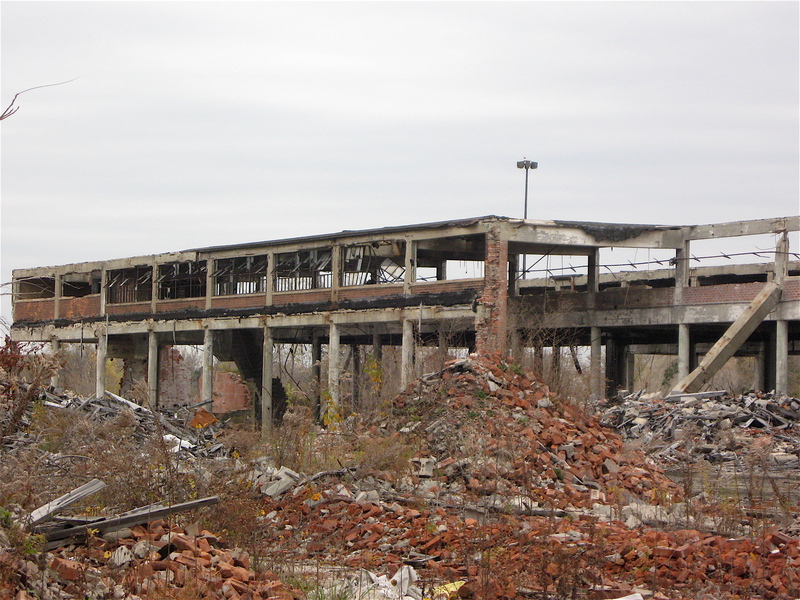 It’s a well-known fact that Detroit once led the world in manufacturing. It’s also not earth shattering news that the city’s manufacturing base has basically dried up, leaving behind hundreds of abandoned factories and small manufacturing facilities. 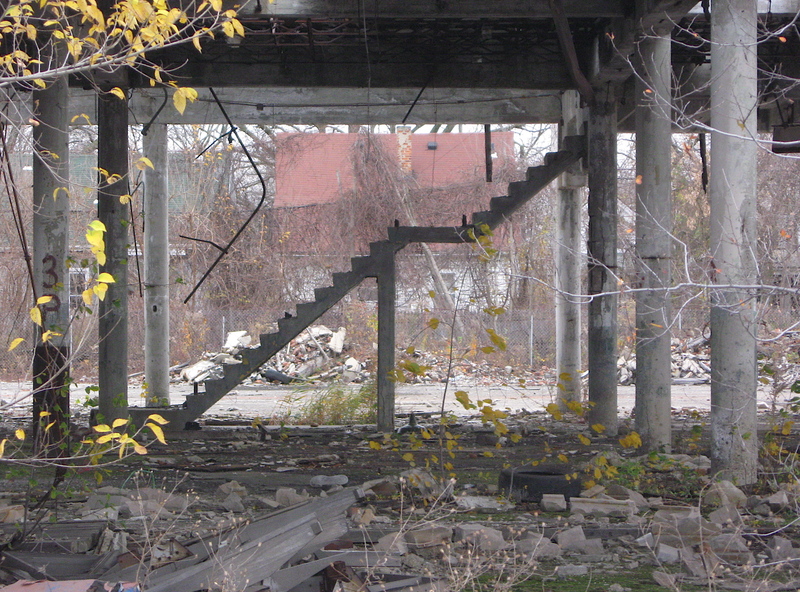 Many, such as the 3-million plus square-foot Albert Kahn designed Packard Automotive Plant on the eastside, have deteriorated beyond repair and are now havens for urban explorers and graffiti artists. 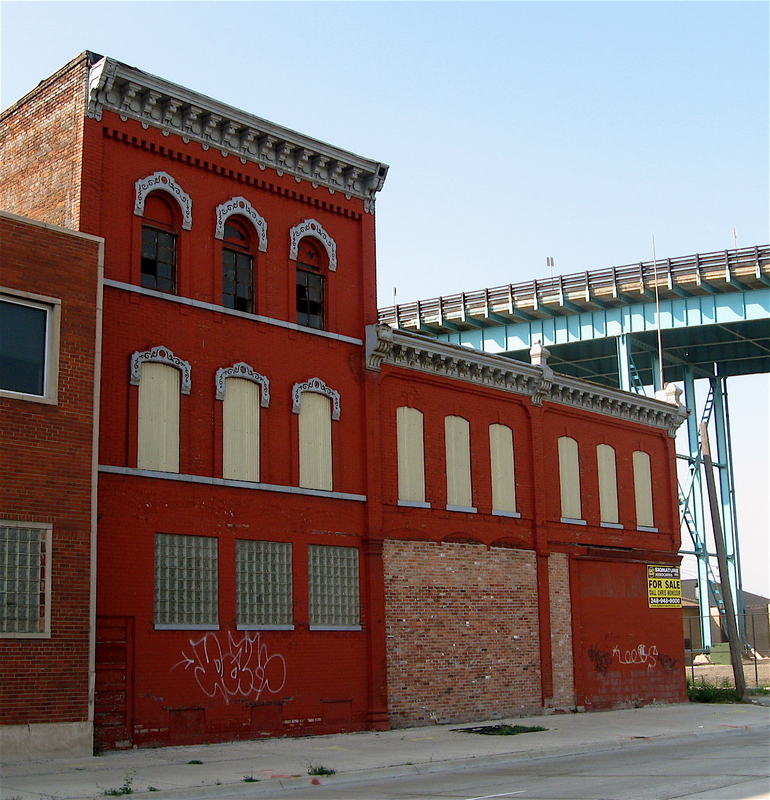 Other former industrial structures have been converted to artist and residential lofts or partitioned into smaller spaces to accommodate new businesses, storage, etc. Many others have been stripped of their bricks and steel supports and left as sad monuments to a once grand, powerful industrial city. One such place sits on Shoemaker Street near St Jean Street on the city’s eastside. The large, low-slung decayed building is somewhat hard to spot, even from a bicycle. It’s almost hidden behind tall, wild trees and grasses that have grown almost the same height of the chain link fence that surrounds the property. But looking around as I rode that stretch of Shoemaker, I did see a couple of chimneys standing alone, in the distance and numerous piles of bricks close to the street. Spotting them sparked my curiosity. 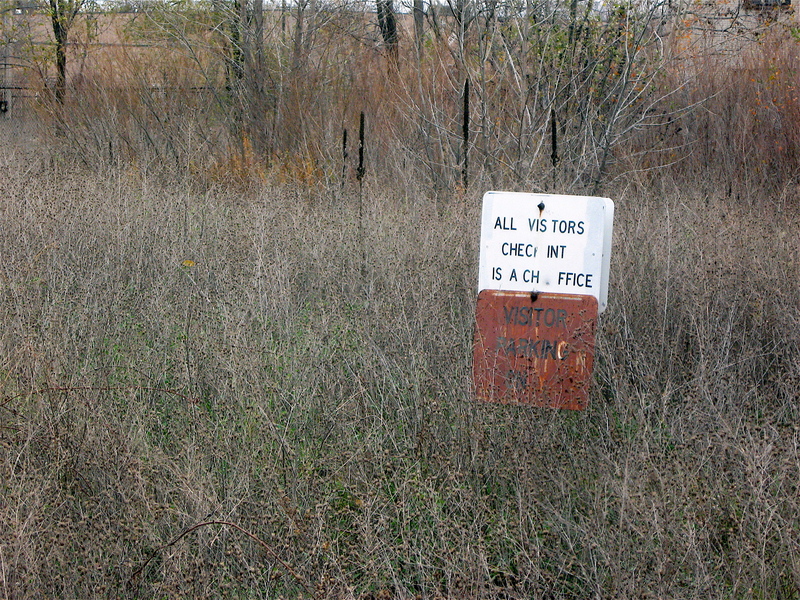 Like many fenced-off, abandoned industrial sites in Detroit, there are always holes in the fences and that was the case here. In fact, the fence gate was completely gone. So, in I went. My first impression riding across the property was the size and condition of the forlorn building and the land it sat on. 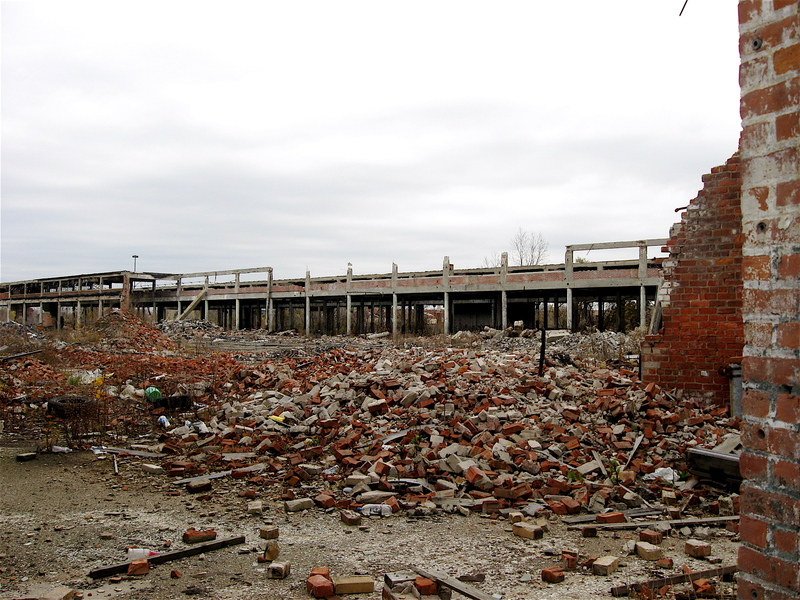 The building was basically a side-less steel shell, with 90 percent of its bricks long gone or lying in broken piles. It stretched the length of a football field, perhaps longer. 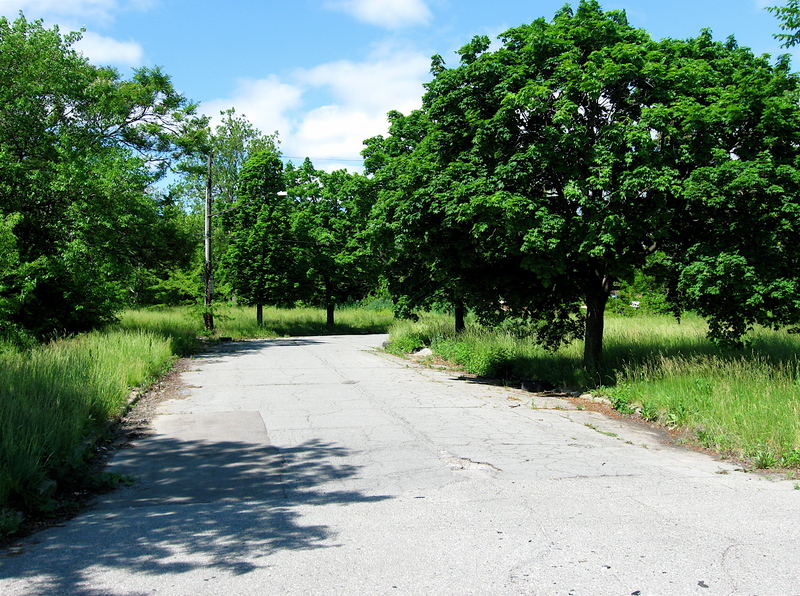 Acres of open land, which I assumed to be parking areas at one time, covered the northeast section of the property. Sitting on the north end are a couple of interesting looking, round, bricked built chimneys still intact. It was an eerie, creepy place with a cement staircase that leads nowhere. The day I was there it was quite windy, and the breeze whistled throughout the skeleton of a building. 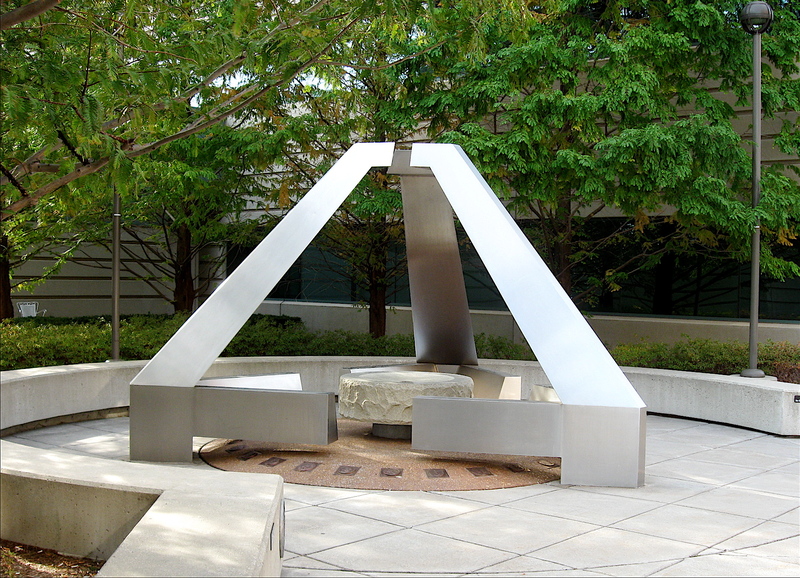 The wind seemed to move some of remaining steel beams or supports just enough to make subtle, melodic sounds. The rhythmic noises reminded me of voices, crying out in the night, much like mythical Sirens calling sailors to the rocks. While poking around the site, I had an unsettling feeling of being watched by unknown piercing eyes. They seemed to be coming from hidden corners of the building and from the far end of the property where abandoned boats had been dumped. Keenly aware of possible escape routes, should wild dogs or something worse appear, I slowly pedaled on, exploring the site, wondering what this place once was. This is a well-written piece of fiction based on a true story. It tells the story of a small resistance movement conceived and carried out by a single man and his wife against the Nazi regime during WWII. Elise and Otto Hampel were a modest, poorly educated working-class couple living in Berlin without any history of political or insurgence activity. That all changed when their son was killed in the war. Their son’s death outraged the couple. Using simple postcards, they devised and carried out a grass-roots civil disobedience campaign, denouncing the Nazis. The small crusade baffled and outraged the local Berlin Police. Thinking they were dealing with a large, complicated resistance movement, the case was turned over to the Gestapo, the secret police of Nazi Germany. Despite ongoing, intense investigations by them and other secret forces, the couple spent many years spreading their message across Berlin via the postcard. The hefty novel reads like a fine, well-crafted mystery, but with a literary slant reminiscent of an engaging Russian novel. A highly visual writer, Fallada describes in vivid detail, the couple’s continuous flow of isolation, sorrow, despair, fear and the agony they are suffering. The descriptions of the Nazis atrocities, the inner workings of the Gestapo, and German prison life are riveting. 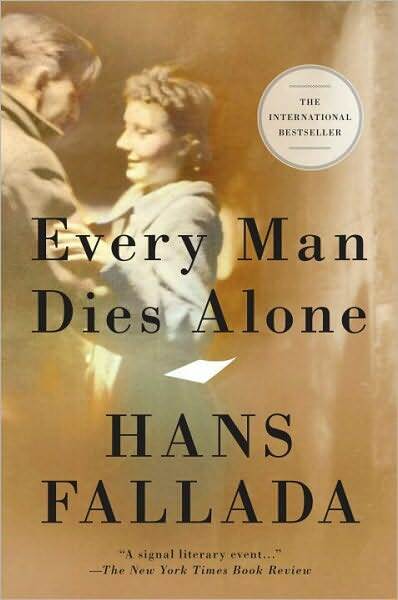 Early in the story, Fallada created an atmosphere of intense paranoia where citizens, friends and even families are afraid of each other, driven by unknown, secret forces and general unrest in Berlin. This underlining theme is woven throughout the book. Reading this passage early in the story, I thought to myself, “How can one not love this character and others, and the author’s visual writing style?” The rich, powerful descriptive writing style and engaging subject matter kept me thinking long after I finished the book. Interestingly, the fact-based story was written over a 24-day period and the author never lived to see it published. What a gift the author left us! The book is highly recommended. On my bicycle travels in Detroit I see lots of birds. There are the proverbial pigeons that seem to hang out in the parking lots downtown. They never seem to move as I ride near them, almost standing in defiance, daring me to hit them. I also see them on rooftop overhangs doing what they do best, making a mess of the sidewalks below. Canadian Geese are everywhere along the riverfront and seem to have taken over many areas of Belle Isle Park. Like their pigeon friends, they too can leave quite a mess. I’ve heard cardinals singing long before I spot them, and Red-winged Blackbirds love the cattail plants and bogs near the canals on the far eastside of the city. Plus, there are the everyday robins, woodpeckers, sparrows, grackles and many others that make Detroit their home. 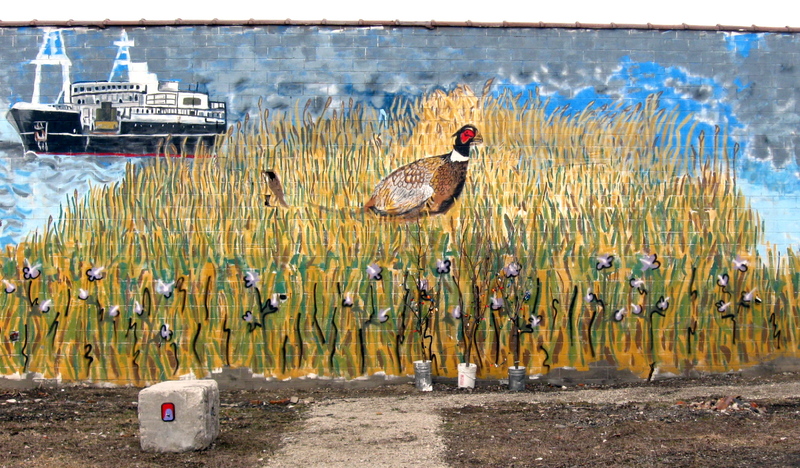 Surprisingly, game birds, in particular Ring-necked Pheasants, are not that uncommon in Detroit. I see the plump, copper-colored, red-faced birds quite a bit as I ride through sparsely populated streets, now lined with fields and grassy prairies. Sometimes they are standing in the street, oblivious to their surroundings, pecking away at whatever it is they eat. 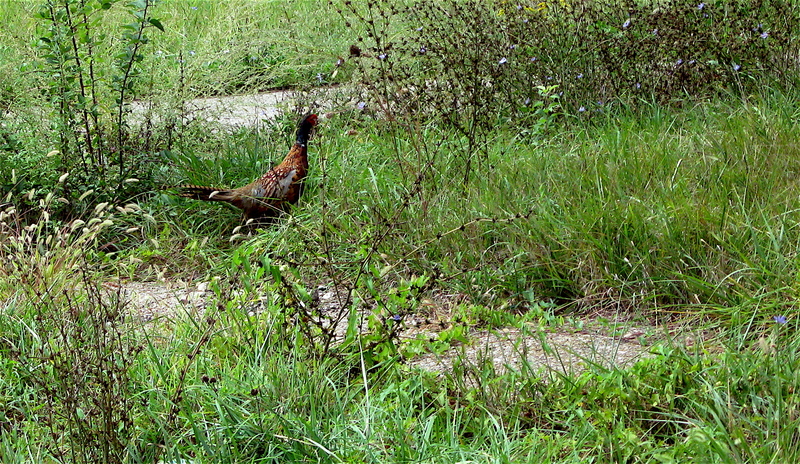 As I approach them, they tend to scurry, rather than fly, into a nearby desolate field or overgrown lot. Once there, they stand silently and motionless in the brush watching me slowly pedal by, hoping I don’t spot them. As I found out early on while riding along the city’s many fields, they are low flying birds. 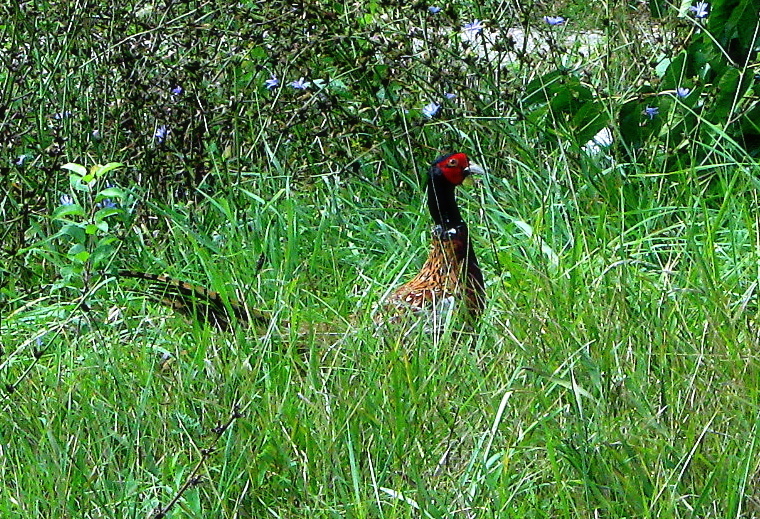 One of the first pheasants I saw on my bike rides nearly flew into my helmet. I was pedaling along, minding my own business, when one of the 2-lb birds sprang from the nearby brush and came right at me. It scared me half to death as I ducked low to avoid a possible collision. A bird of that size could do some serious damage to an unsuspecting bicyclist like yours truly. Since then, I’ve encountered the flying birds many times. Frequently, I’ve been startled to a point of near heart attack, especially when I scare them up while riding across some field. Not so much because of their size, but the loud, distinct wing flapping sound they make upon takeoff. It’s a low piercing, shuttering sound that reminds me somewhat of rapid gun fire. There’s a short street in Downtown Detroit that reminds me of New York City. It’s a narrow street with a narrow sidewalk lined with small trees, and it ends near a quaint urban park. What I like about the street is its scale. The street was developed in the late 1800’s when cars were only a curiosity. There are only two buildings on one side of this short block. They are not massive and both hug the sidewalk, creating a peaceful and warm urban environment that encourages walking. The streetscape, with its ornamental trees and intricate brickwork found on the buildings, is a noticeable contrast to today’s modern, box-shaped buildings built for the car culture. Many of the current, newer square buildings I see while riding along Jefferson Avenue, for example, are set back from the street and sidewalk. 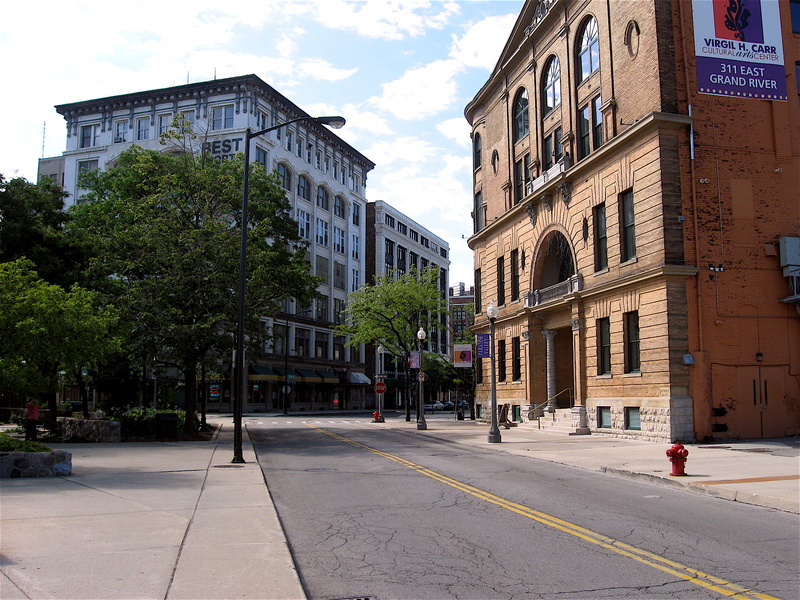 They are usually fronted with parking lots, creating a sense of isolation for pedestrians. 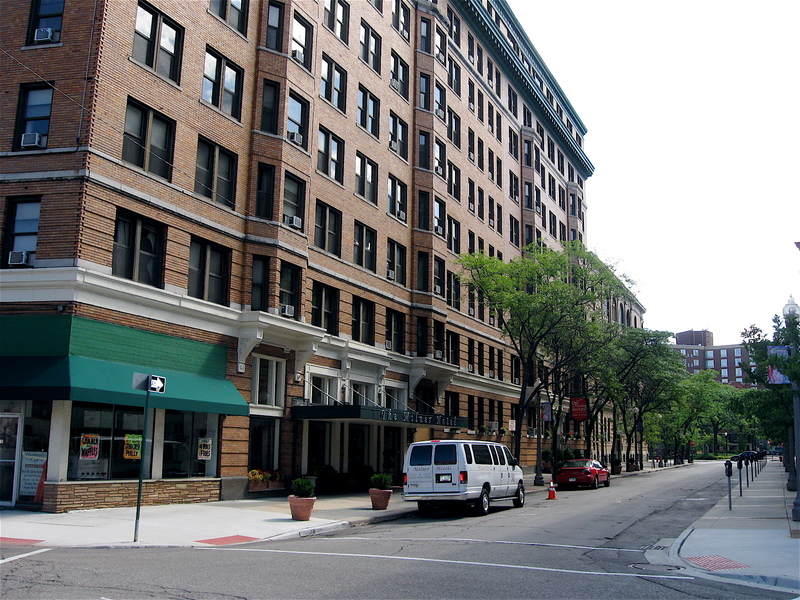 Center Street, with its older buildings, is quite the opposite. It is an integral part of the urban setting in that part of the city. 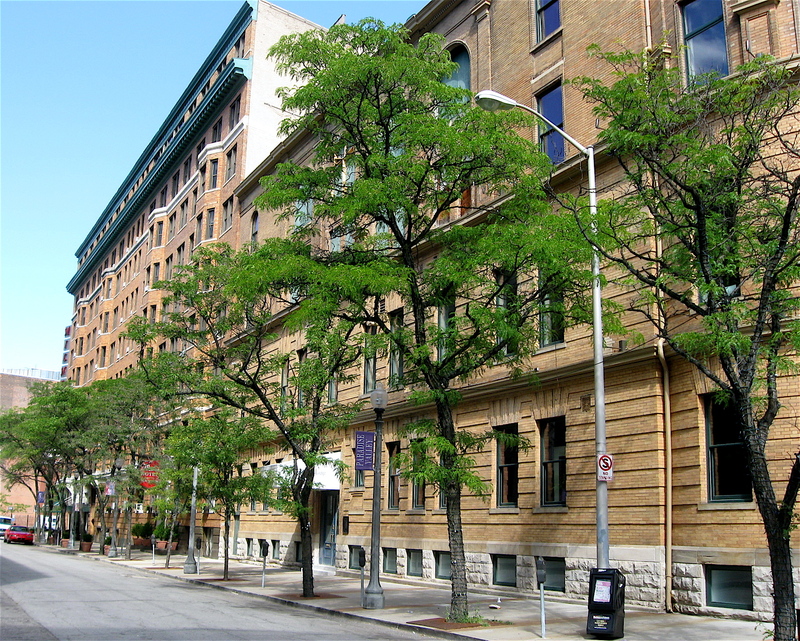 There are two vintage buildings on the short street: the triangle-shaped, 10-story Milner Hotel and the historic Harmony Club known today as the Virgil H Carr Building. The Milner spans about three-quarters of the block. It was built in 1917 in the Flat Iron style of architecture, similar to the famous triangle-shaped Flat Iron building in New York City. Next to it is the Virgil H. Carr Building (Harmony Club). It was built in 1895 for the Harmonie Society, a musical society made up of German immigrants that settled in that section of Detroit in the mid-to-late 1800’s. The four-story building was constructed in the Beaux Arts style of architecture with curved windows and intricate brick work. When built, it included various lounge areas, a tavern, dining areas and recreational rooms such as a bowling alley. I recently took a tour of the place and was surprised to find a large theater currently under restoration on the fourth floor. 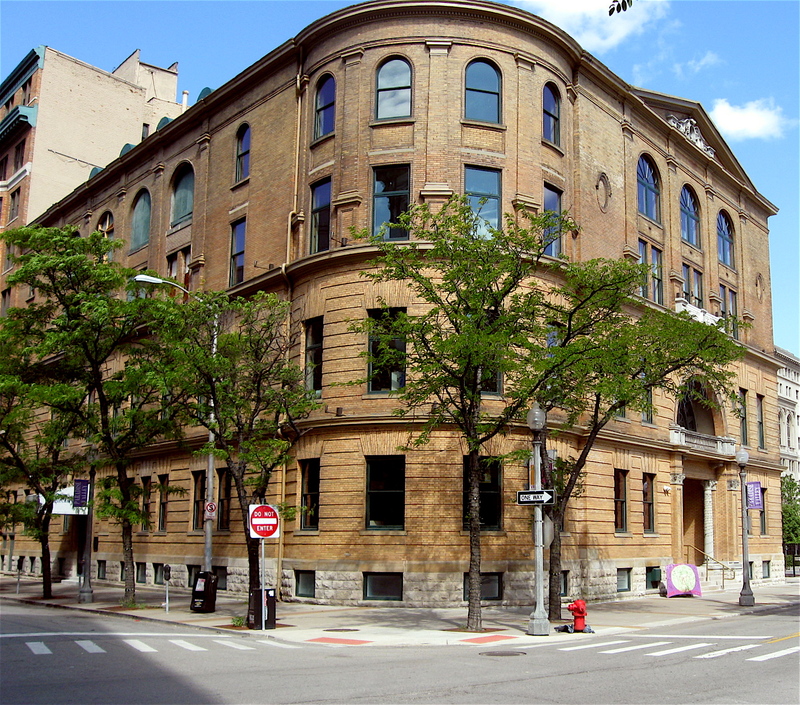 The Carr building is now home of the Arts League of Michigan. Although Downtown Detroit has lost many of the historical buildings through neglect or urban renewal, it’s refreshing to see a little bit of urban density. 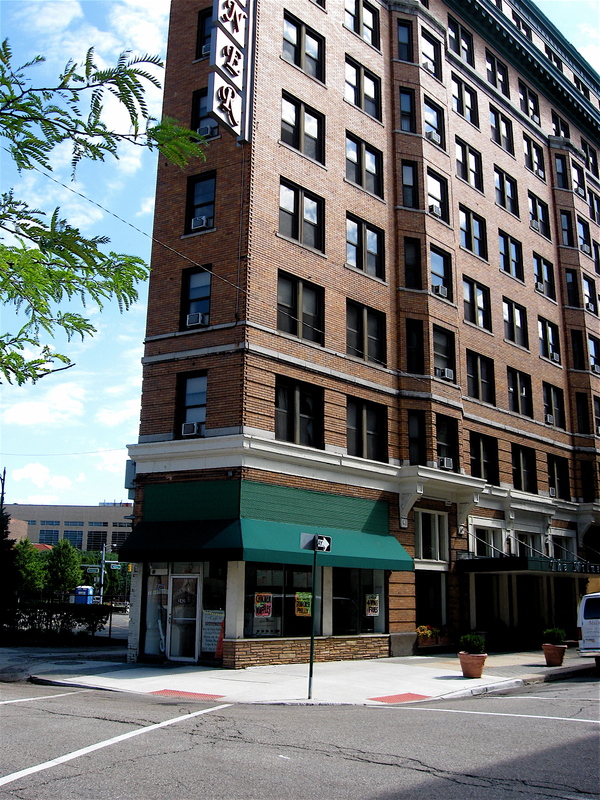 It’s reminiscent of New York City’s Greenwich Village, and it’s right here in Detroit. Two of the many things I really like to check out while riding my bike in Detroit are trains and graffiti. As I’ve written in the past, trains are powerful, snake-like monsters made of steel that move tons of industrial products, chemicals, automobiles, coal and many other goods across the city and beyond. They continually evolve. Cars are added and removed. Huge, impressive engines are hooked to long lines of rail cars which are needed to pull them to unknown destinations. Depending on the cargo or liquids they are hauling, and where the goods are going, rail lines are switched in an almost archaic, mechanical way, allowing the heavy trains to slowly change direction. 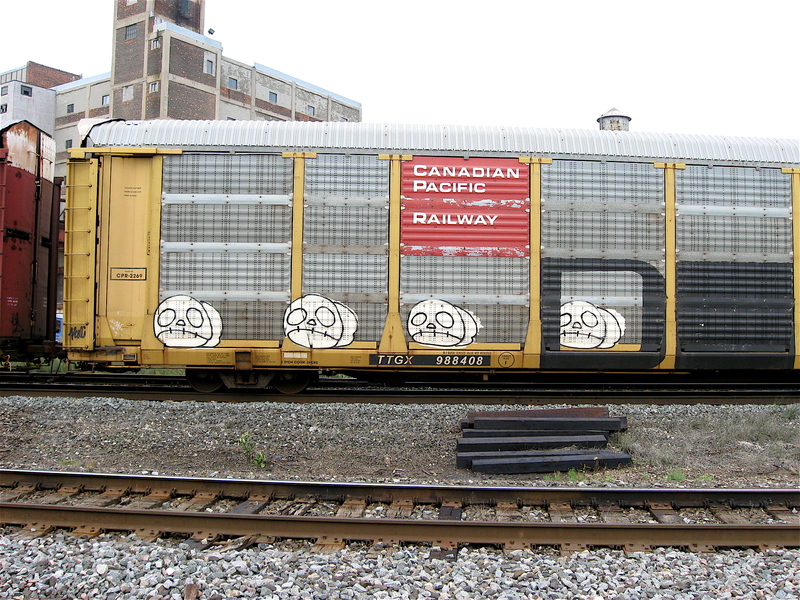 Many, if not most, of the railroad cars I’ve seen while pedaling through Detroit usually have some sort of graffiti painted or sprayed on them in a variety of styles. I’ve seen wacky caricatures painted in bright colors and multi-colored names with three-foot letters, some stretched across the total length of a boxcar. 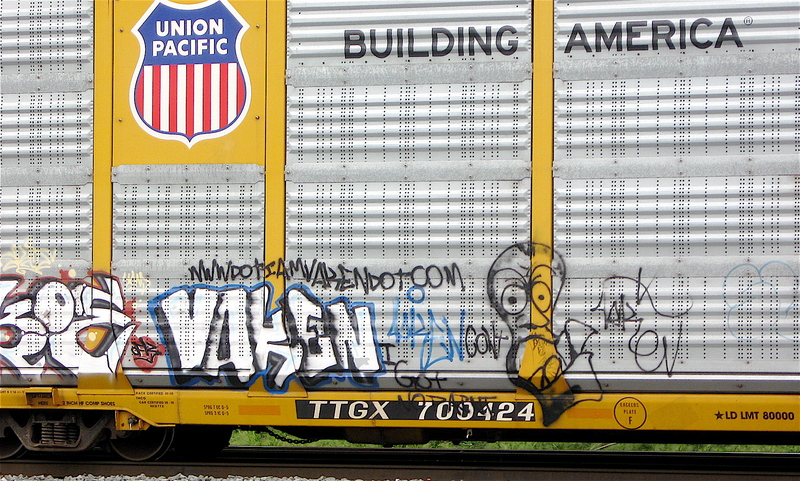 Quick hitting, one-color tags and pointed sayings sprayed on tanker cars are also part of the mix. 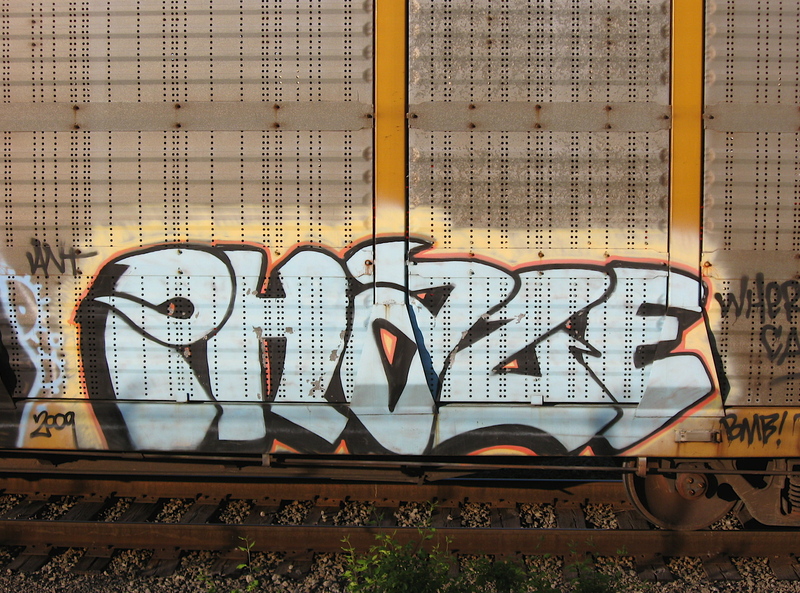 Graffiti on trains can be fleeting. It can appear in a brief instant as a train clamors by at a street crossing. Sometimes I only see them for a matter of seconds and then they are gone as quickly as they appeared, much like a vivid dream. While bicycling throughout Detroit and along the city’s various railroad tracks, I’ve been fortunate to stumble upon a train yard or two. There I’ve seen stretches of shiny track where railroad cars are in a holding pattern, waiting to be pulled to far-away places. It is in those out-of-the-way places where I’ve had plenty of opportunities to view graffiti close-up. The crispness and colorful detail of this art is an amazing sight to see before it is rolled away to be viewed by a potential audience numbering in the hundreds of thousands. For graffiti artists, I can only assume that their modern art form on a canvas of steel is the perfect palette and ultimate showcase for their colorful art. Take a look at the work next time you are stuck at a crossing counting railroad cars. 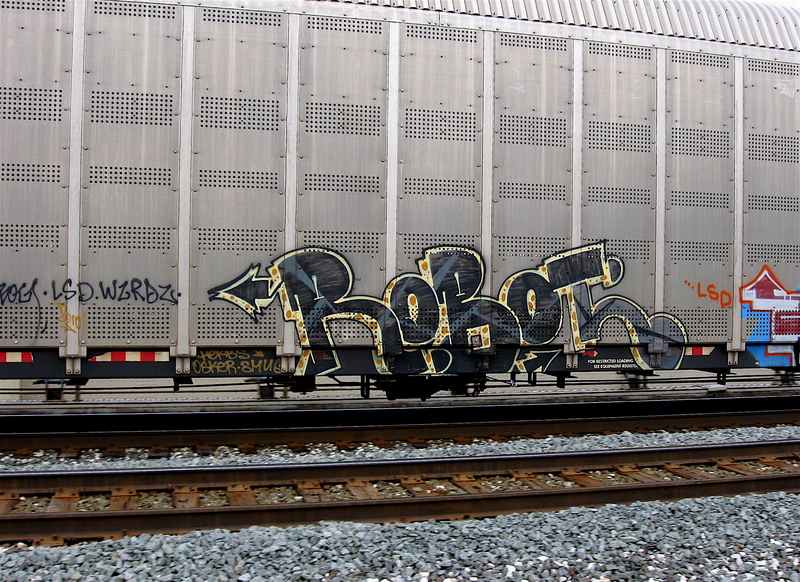 If you are interested in reading more about Detroit graffiti or trains, click on the links below. It’s hard to imagine that I’d be writing my 100th blog entry on bicycling across the City of Detroit! In the 4,000 plus miles of riding in the city over the past two years, I’ve met some remarkable people, stumbled upon some bizarre sights and have seen firsthand, the effects of poverty on this city. Because this is my 100th entry, I thought I’d highlight a few from the past that I think are worthy of revisiting. About a year ago, I posted a blog entry on the top seven visited sites over the first 52 weeks of this blog (click here to read it). As I mentioned back then, seven had no relevance; it was just a number I randomly chose. To keep things consistent, I’ve selected an additional seven entries to feature. Narrowing close to 100 stories down to that number was a chore. After careful review, I feel the seven I’ve chosen represent a broad cross-section of what I’ve discovered on my bike rides across this great city. Click on the bold headline above each photo and through the magic of the Internet, the story will appear on your screen. Take a read and let me know what you think. 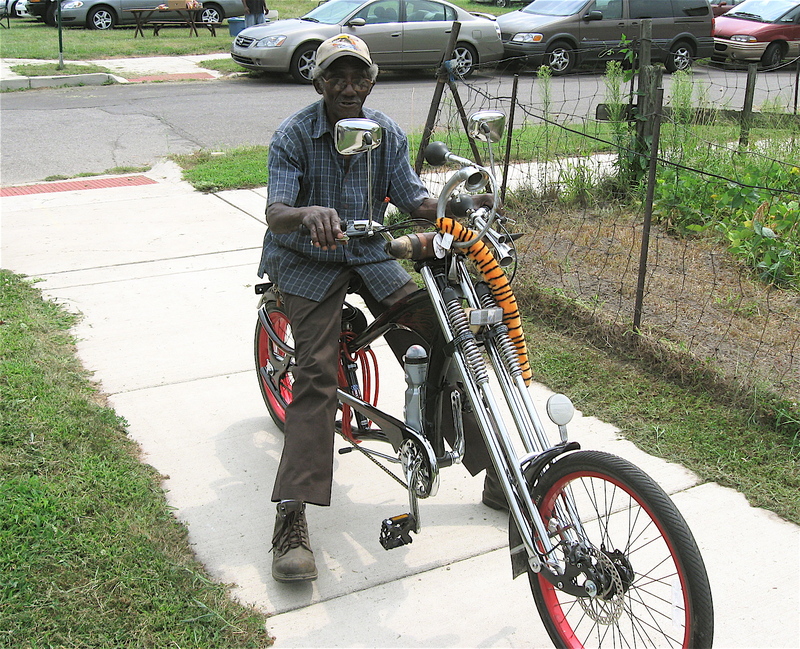 This entry is a good example of the unusual, colorful characters that live in Detroit. This particular gentleman was rather boisterous and quite entertaining. Rather than complain about a blighted house on his street, he turned it into a positive by placing a clever, humorous sign among the rubble. One of the sights I’m always amazed at is the abundance of open land in this city. There is something like 40 square miles of it and most have reverted back to prairies and woodlots. This eastside Detroit neighborhood of fields and grasslands reminded me of trip down a country road. The only thing missing were deer. In my mind, these colorful beauties that slowly cruise the neighborhood streets represent Detroit’s entrepreneurial spirit. The noisy vehicles are painted in eye-catching colors and blast ear-piercing music in an effort to sell their frozen goodies. 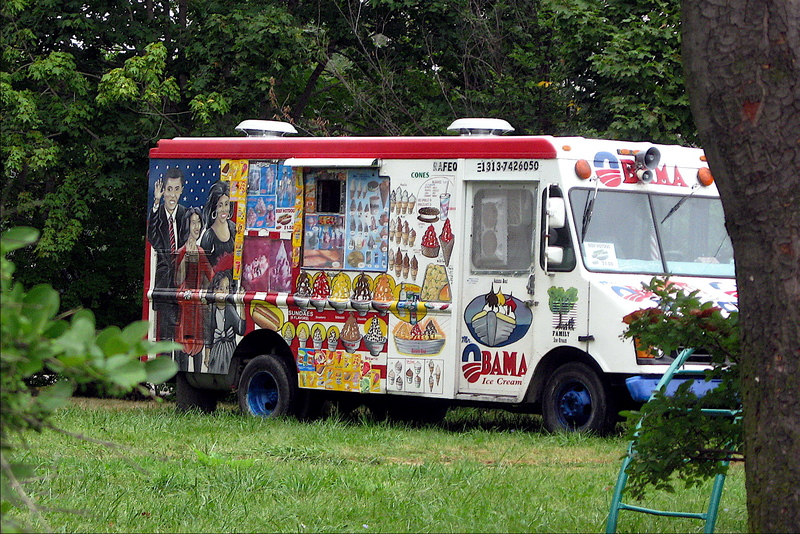 I like the unique company names painted on them and especially admire the Mr. Obama Ice Cream truck with the first family’s smiling portrait. Detroit is cultural hub of many ethnic groups. 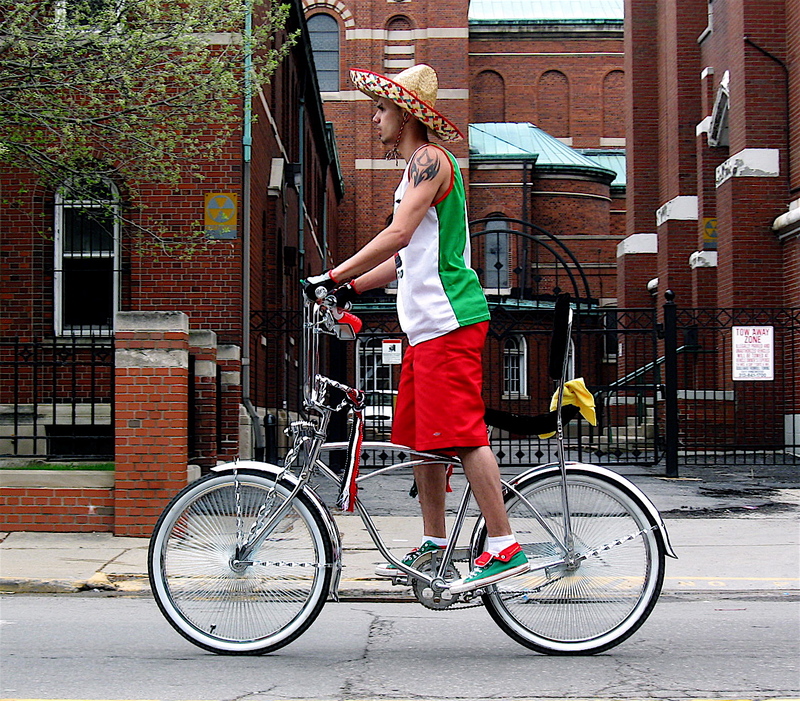 This entry showcases the vibrancy, cultural heritage and colorful traditions of the large Hispanic population that is centered in lively Southwest Detroit. Their annual parade is one of the best in the city and stretches for miles along Vernor Highway. 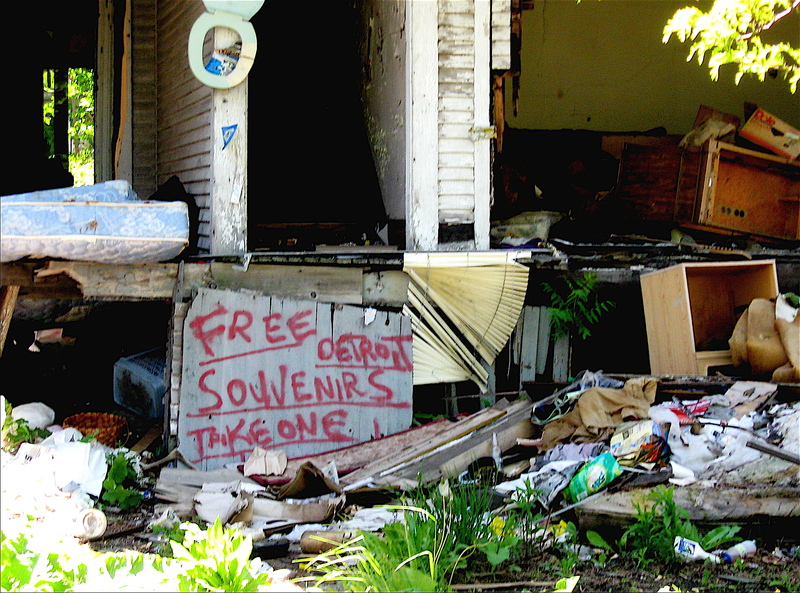 Despite Detroit’s urban blight and widespread poverty, there are many areas of the city that are stable and strong. The DMC is one of them. In the center of their enormous campus is a park like setting with a large concentration of some of the best outdoor art pieces I’ve seen on my two-wheel travels. Detroit has a long history of building custom, flashy cars and that Motorcity tradition has worked its way down to bicycles. Pedaling throughout this city’s neighborhoods, I’ve seen many unique, custom one-of-a-kind bicycles. 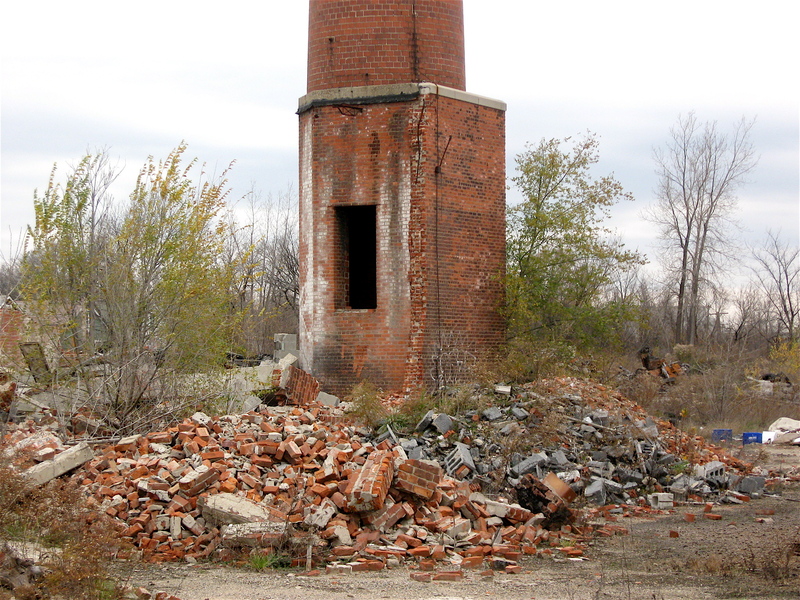 There are especially prominent in the environs of Southwest Detroit and along the City’s waterfront. This entry showcases the variety of non-residential architecture that can be found along Fort Street. As Detroit grew out from the city center over the years, building styles changed and they reflect the era in which they were built. The range of architectural styles on Fort St. can also be found along many of the city’s other, once prosperous commercial streets. Many are in remarkably good shape. A big thank you to everyone that reads this blog! I truly appreciate it and please, keep those comments coming!